Our Malteser® and Smarties Tree will certainly make any occasion memorable! Each tree is edible right to the core, the only bit you can’t eat is the stem and vase. The centre has a crispy krunch chocolate centre so once you have picked the Maltesers® and Smarites just keep munching! 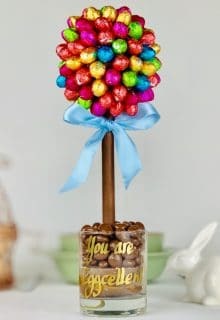 Maltesers® decorated with bright Smarties, – a fantastic favourite for kids and adults to share and a colourful centre piece for any occasion. Delivery information: We normally always process and dispatch orders within 24 hours, Monday to Friday. Orders placed on Friday – Sunday will be dispatched on Monday. If you are sending directly as a gift and have a preferred dispatch date, please just let us know. We use Royal Mail so cannot guarantee exact arrival times, but we can post it to match as closely as possible the date specified. For guaranteed delivery date, (Mon-Fri only, signature req), opt for Express Delivery.